>I would be fairly sure that most 2m WSPR users would be happy to QSY to 144.492 dial freq which would make a TX of 144.493500 (+- 200 Hz). If the WSPR users in IARU Region 1 that are currently using a ‘dial frequency’ of 144.489MHz moved so that their transmissions did not cause interference to other band users, it would be very good start. If they transmitted (NOT DIAL!) on a frequency of 144.4920MHz these users would no longer cause interference to legitimate band users. If then over the time before the next meeting of IARU Region 1 VHF managers in September 2017 it could be demonstrated that there were enough VHF WSPR users in IARU Region 1 behaving in a responsible manner, the VHF managers might reconsider the removal of WSPR from the IARU Region 1 band plans. So this means, if people could operate dial 144.490500 with TX range then becoming 144.491900 to 144.492100, this should help resolve issues. 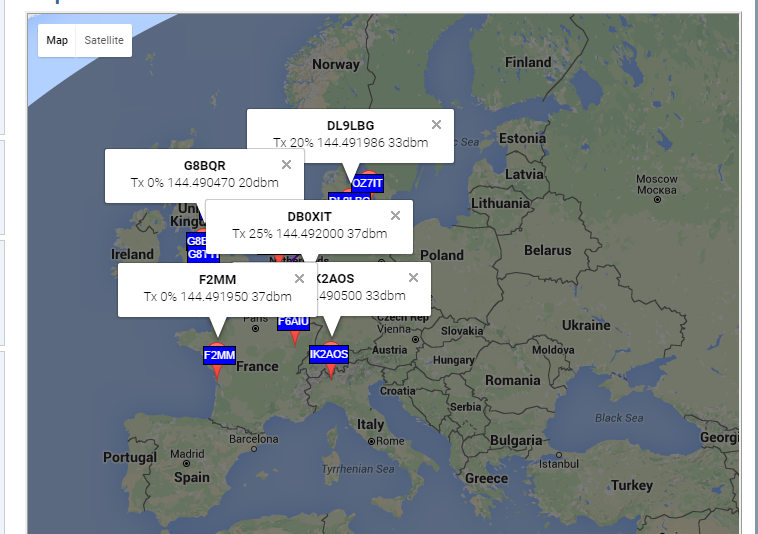 I notice that other stations are already TXing in the requested range as seen in the attached map. Obviously we need all users in region 1 on this freq range to give the best results. As I see it there is a flow on effect into region 2 where people who may be looking across the Atlantic Path for weak signals will also need to be on same freq.